Promote your local business where your customers are. Global Kite Spots attracts four to six thousands visitors each month, all looking for their next kitesurf adventure. The niched audience and task oriented (plan their next kitesurf holiday) nature of the site makes it the perfect place to introduce your local business to them, be it a kitesurf school, hotel or organiser of downwinders. 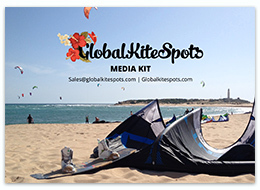 Global Kite Spots is the perfect platform when you want to advertise to kitesurfers. There are two ways to promote your business on Global Kite Spots. For inquiries please get in touch with the form below.